eHost has been in hosting industry since 1996 but underwent a revamp in 2015 and introduced many new changes. Besides the new website design and layout, eHost changed their hosting control panel and they changed from vDeck to cPanel contol panel. eHost Review – Is it the Best Web Host? The company eHost is a US-based which has been in operation since 1996. They are based in Houston, Texas and claim to serve over 1 million websites on hosting their platform. eHost provides low-cost, feature rich, cPanel based shared web hosting. Beside the free domain registration, which is very common offer in the hosting industry, eHost web hosting includes many other excellent features such as: simple, easy to use drag and drop website builder tool for website creation, $300+ worth Marketing and advertising suite to boost up your website traffic, 45-day unconditional money back guarantee, if you feel eHost is not best host for you within 45 days they will give you your money back, no questions asked and much more. However the company provides hosting services for nearly 20 years, they are not that much popular. In 2015 eHost has got a new web page design and layout as well a new web hosting control panel. In the early stage eHost was running on vDeck, but as many other well known hosting service providers, they have decided to switch to cPanel (Control Panel), a more reliable, user friendly and feature rich control panel. Beside the re-design of website, eHost has introduced many new and improved features as well lowered the price. eHost mainly focuses on simplicity. The company’s primary virtue depends in their drag-and-drop website builder, which comes with more than 1000 pre-designed templates. The site builder is a very easy tool that helps users to design a website quickly, without the need of any coding or programming language. This tool could be especially,beneficial for newbie users, who don’t have much knowledge of website building. In the next paragraph of this page, we will go deeply, and will examine each and every aspect of the company eHost.com: technical support, reliability, service uptime, guarantees, and will also talk about pros and cons of their service. Please continue reading our complete eHost review to find out if the provider meets your exceptions. At the end of this page you will find conclusion and customer reviews on eHost.com. Avail exclusive 70% Off on eHost Hosting Plans. Discount updated on – 1st Aug 2017 – It’s a Limited Time Offer. INR 3388/- for 24 months ($2.09/mo.). Affordable Web hosting plan: with the current 50% offer, for only $2.75/mo. you will get a web hosting plan that contains all the essential features that is required to start and run a successful small business website. cPanel Based hosting: The cPanel industries best control panel allows you to have full control over your website. Add new domains, sub-domains, easily install custom scripts such as WordPress, Joomla, Drupal or Magento, create new email accounts quickly and very easily. Drag & Drop website builder: this site builder tool is perfect for beginners, who are going to create a website, but have no skills and experience though. Their site builder tool allows you to quickly build a custom webpage, publish content, upload pictures, create a contact form for your website and publish it online, without the need of writing a single line of programming language. Guaranteed customer satisfaction: with the 45 days of money back guarantee offered by eHost.com, you have sufficient time to check and have a good view on their service and customer support. Please note that domain registration price non-refundable. Check out eHost’s terms & Conditions to see how how the refund policy works. Free marketing & Advertising credits: every new hosting plan includes $100 Yahoo/Bing as well as Google advertising credits, that you can spend on driving traffic to your newly designed website. This will be an excellent boost for building up your brand value and increase your sales. Only shared Server hosting: this will not be a trouble for low visitor web pages. Although web pages that will grow over time, must needing a VPS (Virtual Private Server) or dedicated hosting, will have to be shifted to other hosting provider. With exciting tutorials online, plus free SEO(Search Engine Optimization) tips and tricks available, eHost is a Consumer Ranking Award receiver. Their website analytics tool offers site traffic reporting as well as daily visitor statistics, with access to Google Webmaster Tool available as well. Sites are responsive and mobile-optimized, with social media integrations and tons of other apps available. Get access to online marketing tools and create a free online store with with their excellent eCommerce package, cPanel only. PayPal integration and shopping carts options are also available. Get more exposure to your brand with $100 credit towards Bing/Yahoo! paid advertising, and extra $100 towards Google AdWords advertising credits. Yellowpages.com listing is absolutely free and a US-based, toll-free phone support is also included. Manage your unlimited email accounts at your domain with the help of a single cPanel account. Unlimited email addresses, supported by POP3 and IMAP, come with all the hosting plans. They also provide customizable spam filters and virus checking options. Email forwarding and auto-responders option is also available. Not only is their highly expert customer staff looking out for you, they have got 24/7 network monitoring service. All eHost hosting packages are guarded by an enhanced security suite valued at over $100. The backend and control panel of eHost is as smooth and intuitive as their hosting price model is interesting. There are many application integrations and other extra at your finger tips. Their easy to use drag-and-drop website builder is sleek and accomplished, but if you miss any of your favourite CMS tool such as WordPress, Joomla, Magento, B2evolution and Drupal, their cPanel based web hosting permits you to easily install them. eHost keeps things easy, with their 36 months (3 year) plan costing an extremely reasonable $1.65/mo. You can purchase added eCommerce features once you are signed up for eHost’s hosting, and the charges of the hosting subscriptions rise the lesser time you commit to. eHost is an ideal option for newbie in business as well for web design beginners. Giving you the power to use their innovative and easy to use drag and drop site builder with tons of free templates, you will have the freedom to add whatever you want to. This option includes eCommerce features to create an online store, ecommerce website, great blogging tools and interesting images and videos and much more. With a 50% of amazing discount, and a 45-day money back guarantee. You must try eHost web hosting without any worry. Bluehost is a leading web hosting solutions provider. Since their founding in 2003 by Matt Heaton, Bluehost has continually innovated new ways to deliver on their mission: to empower people to fully harness the web. Based in Orem, Utah, they provide comprehensive and complete tools to millions of users throughout the whole world so anyone, beginner or expert, can get on the web and thrive. One of the oldest and popular web hosts started in 2003, Bluehost.com has become the biggest brand name when it comes to WordPress web hosting. They are an official “WordPress” recommended web hosting provider. With Bluehost, you don’t have to worry about your website being slow or down even when there is a lot of visitors or traffic. Their 24/7 professional support is always available to help when you need it by telephone, email, or live chat. They are rated No.1 in web hosting for small to mid businesses. On top of that, they are offering UpdatedReviews users an exclusive 60% off amazing discount, a Free Domain and a free website Builder with beautiful templates. If you are searching for something economical and basic, Bluehost shared hosting is probably what you need. This is the best option for beginners and small businesses. Dedicated hosting is one of the most high cost option, suitable from large commercial websites/businesses that need complete control of their resources. With dedicated server, you are essentially renting entire physical server. VPS hosting is a middle-ground choice where you share a physical web server with other users, but you have your personal virtual operating machine, so the server resources and functions as if it is physically yours only. BlueHost WordPress hosting is of course what it sounds like—hosting especially optimized for WordPress users. Let’s take a look at the plan in details. Bluehost Coupon – Get Exclusive 50% Offer on Bluehost Hosting Plans. Discount Updated on – 1st January 2017 – Limited Time Offer. $142.20 ($3.95 for 36 months). Starter: Starting at $3.95 per month, this plan jumps up to $7.99 per monthly billing at the regular price. Plus: Starting at $5.95/mo. Regularly $10.49 per month. Business Pro: Starting at $13.95/mo. Normally $23.99 per month. These hosting charges are all pretty good. But with Bluehost coupons can make sure you get the best price! Stay tuned for Bluehost Black Friday deals. With basic plan you get 1 website, 50Gb space, unmetered bandwidth, 5 parked domains and 25 subdomains. With the Plus or Business Pro packages, you get unlimited number websites and unmetered web space and bandwidth, which is really amazing. You get 1 domain included, and you can have unmetered parked domains and sub-domains included. Email id’s and web storage are unlimited, along with $200 in search engine marketing offers. Plus contains Global Cloudflare CDN and 1 SpamExperts . The Business Pro package contains up to $180 in annual extra benefits, containing two SpamExperts, one SSL, sitelock, unique IP addresses, domain privacy, spam protection, and SiteBackup Pro. Standard VPS: $14.99/month. Regularly $29.99/mo. Enhanced VPS: $29.99/month, Regularly $59.99 monthly. Premium VPS: $44.99 monthly, Regularly $89.99/monthly. Ultimate VPS: $59.99/month, Regularly $119.99/monthly. These charges are in line with typical prices for VPS (Virtual private Server) hosting industry-wide. The speed for the first two VPS plans is 2 cores CPU, 3 and 3 cores for the other two plans. You get 30GB SAN storage space at the lowest level, up to 240GB at the highest level. RAM ranges from 2 GB to up to 8GB. You get 1TB of bandwidth/transfer at the Standard level plan, up to 4 TB at the high end Ultimate plan. Each level includes one domain. The Standard package includes one dedicated IP address; you get two ip’s with the rest of the packages. Every hosting plan is backed by 24*7 professional support and a 30 day money-back guarantee. Standard Server: Starts at $79.99/month, Normally $149.99 per month. Enhanced Server: $99.99/month, Normally $159.99/month. Premium Server: $119.99/month, Normally $199.99/month. With the Standard plan, Enhanced and Premium plan, you get 4 cores, 8 threads. Available storage space is 1 TB (mirrored), and RAM starts at 4 GB at the Standard plan, ranging up to 16GB at the Premium level. You get 5 TB of transfer at the Standard level, 10 TB at the Enhanced level, and 15 TB at Premium level. One domain name is included with every dedicated hosting plan. Wp Standard: $19.99/month, Regularly $39.99/mo. EWp Enhanced: $29.99/month, Regularly $59.99/mo. Wp Premium: $39.99.00/month, Regularly $89.99/mo. Wp Ultimate: $49.99/month, Regularly $129.99/mo. These hosting plans are actually quite expensive compared to other popular hosting providers. WordPress hosting at Bluehost is a big deal, however one of the most popular web hosting company host over 1 million WordPress websites. Features include at the Wp Standard level include 100 million monthly visits, 30 GB of storage space, 30 GB of backup space, 2 GB of RAM. You get included domains-1 and one IP address. Extra features include enhanced cPanel, SiteLock CDN, and SiteLock Pro for more security. The top-level Wp Ultimate plan gives you unlimited monthly visits, 240 GB of storage space and backup space, included 8 GB of RAM and you can host up to 30 websites. It also includes 1 domain and 1 IP address, along with enhanced cPanel (control panel)and SiteLock CDN/WAF Pro, you get SiteLock Enterprise and Positive Wildcard SSL with this package. Is BlueHost a good Option for WordPress websites? Our answer is absolutely yes! BlueHost has been the official website hosting partner of WordPress.org since 2005. The good things about BlueHost hosting is that, beside the standard shared hosting packages, they also offer WordPress optimized hosting solutions. This means, that the web server where your WordPress based website will be hosted is specially designed and optimized to run WordPress features at full capacity. The Bluehost WordPress hosting plan although will cost much extra, but till the time your website does not get a massive amount of daily traffic visitors, the shared hosting plan will do the good job. As mentioned above, you can install WordPress automatically, using the Mojomarketplace script installer application. BlueHost is one of the very few web hosting providers that offer 24×7 telephone, live-chat and email support. We have found their support team to be adequate at the very least, when it comes to replying normal technical queries or looking up for other site-specific issues. The support response times are not that awesome although, and they extended quite a bit, from more than 8 minutes to 30 minutes. The first reply has been an system-generated response in quite a few cases, too. BlueHost could not remind me that they are actually a very economical shared hosting provider when our team tested out the other parts of their overall service, but Bluehost support was an exception. We really missed the professional, efficient, fast, 100% human-powered support that hosts like IPage, Hosting Raja, InMotion Hosting provide. Bluehost offers a very user-friendly and easy to use control panel that is built as per industry standards. It is possible to handle and manage websites, emails accounts, databases and install important application like WordPress, Java, Joomla and much more from the control panel itself. It also provide an effective drag-drop website builder tool like Weebly. Furthermore, the WordPress is another best platform to create a website or blog. With the help of accompanying Mojo marketplace, users can download other tools and CMS too. Although Bluehost takes automatic daily, backups and monthly basis backup, users have the option to backup their website manually as well, and change the automatic backup frequency from the control panel. We give thumbs up to Bluehost for their uptime consistency in the recent times as we currently host our clients websites on 2 shared server and 2 VPS server. Upgradation of Server and regular maintenance downtime are acceptable and don’t influence the server uptime guarantee. There is a very rare server downtime in shared hosting due to its nature of shared hosting environment. No host can provide you the guarantee 100% uptime, but their VPS servers have remarkably done great apart from 2 server interruption in 2014, they are giving consistently good uptime till today. Bluehost offers a 30 days money-back guarantee, which means that first-time users of Bluehost can try out their preferred web hosting package for a period of 30-days without any worry. They can opt not to continue with Bluehost services within 30 days of time and get their full money back as a refund. This is a plus point by Bluehost and if the customer reviews are anything to go by, very few opt out of their hosting services. The 30 days money-back guarantee just helps build trust and relationship with users who have never dealt with the Bluehost services before. There are many of amazing features and extras included at every cost factor, and the variety of plans offers a lot of flexibility for every type of budget. Whatever your requires, Bluehost delivers in terms of its hosting packages. Despite few negative feedback, the majority of Bluehost customers are quite happy with the services offered. There is a strong reason that this company has such a strong reputation over 13 years of online business! In Addition, Bluehost is really one of the top few that I would personally recommend to anyone and everyone. If you are looking for a web hosting company with a rock-solid reputation, then look no further than Bluehost. Inmotion hosting is a leader in offering business-class premium hosting solutions. It’s services include shared web hosting, VPS Hosting, reseller hosting, dedicated server, wordpress hosting as well as web design. The company can be considered a well-experienced in the hosting industry and is the another most popular option among webmasters, web developers, small-mid sized businesses and enterprises. Below Inmotion Hosting review is based on our editors real experience and more than 200 reviews we have collected from its current and past customers, with which you can better know about their services. InMotionHosting Review – Is it good Hosting Option? InMotion offers a wide variety of web hosting plans for small to large sized businesses websites through shared plans, VPS plans, dedicated servers and reseller plans. The company was established in 2001, located in Los Angeles, CA and Virginia Beach, VA and has rapidly grown because of its excellent support and reliable service. InMotion Hosting is certified by CNet for more than 10 years and has been also authorized by BBB with an A+ grade. The company is the most preferred choice among small and medium businesses who need a fast , secure and reliable hosting service. As InMotion Hosting offers various hosting solution, with which its users could easily upgrade the web server increasingly based on the progress of their business. InMotion Hosting is also popular for its extremely fast server, and quick customer service, guarantee of 100% customers satisfaction, and industry leading guarantee of 90 days full money back. InMotion Hosting is not designed to compete with other popular web hosting providers on cost, but offers incredibly fast, secure and reliable services, with its easy-to-use control panel and professional customer service. It is very popular for its Business Hosting which is ideal for all type small businesses. InMotion has three Linux-based shared hosting plans. The most basic plan, Launch starts at $4.89/mo. supports 2 websites, 25 sub domains and six parked domains. Power starts at $6.29/mo. Supports 6 websites and 26 parked domains, while Pro 10.49/mo. offers unlimited websites and unlimited domains. All InMotion shared hosting plans include unlimited email, storage, and monthly data transfers, which is a nice touch. Discount updated on – 1st Jan 2019 – No coupon or promo code needed, 25% price discount on InMotion Shared web Hosting. InMotion offers 3 type of rock solid VPS (virtual private server) hosting. The basic plan, VPS-1000HA-S starts at $29.99/mo. includes 4GB of RAM, 2TB of monthly data transfers, and 60GB of storage. The best value VPS-2000HA-S plan starts at $49.99/month includes 6GB of RAM, 3TB of monthly data transfers, and 130GB of storage space. While VPS-3000HA-S starts at $74.99/mo. includes 8GB of RAM, 4TB of monthly data transfers, and 200GB of web space. All of these three packages includes some common features like Unlimited email accounts, domains, websites, free domain registration and MySQL databases and much more. Dedicated hosting is one of the most powerful and last resort for the most resource-hungry web pages and online projects. Unlike the shared hosting solutions and Virtual hosting plans, you will be allotted your personal server. This means you won’t need to bother about sharing resources with other users and all the issues associated with that. InMotion offers 6 types of dedicated Hosting Plans. Essentials.Affordable Linux Dedicated Servers. $99.99/month. 500GB SSD or 1TB 7.2K HDD. 8 GB RAM. 6 TB bandwidth/data transfer. 5 IP’s included.receiver. Advanced. Linux Dedicated Servers best for responsive, more powerful websites. $159.99/mo. 500GB SSD or 2TB 7.2K HDD option. 16 GB RAM. 10 TB bandwidth. 10 IP’s. Elite. High Performance Linux Dedicated Servers. Monthly $229.99. RAID-1, 2x500GB SSD or 2x2TB 7.2K HDD. 32 GB RAM. 10 TB data transfer. 15 IP’s included. If you are searching for WordPress hosting for your website, InMotion offers solid wordpress hosting packages. The Website host’s Linux platform based, WordPress-optimized servers (starting at $5.99 monthly) come with the content management system (CMS) preinstalled, and offer free automatic backups and automatic software updates. Although, InMotion will not automatically update any third-party WordPress plug-ins, or provide any type of WordPress-specific security features or page caching. InMotion guarantees rock-solid 99.9% uptime for all the customers, and has put a lot of effort to fulfill this commitment. This company utilizes 2 peerless climate controlled data centers on the West Coast and East Coast of US respectively, both of which are powered with hundreds of high performance web servers, 24/7 UPS power supply and many diesel generators, Standard data centers run Computer Room Air Conditioners nonstop. All the required and top facilities allow the company to provide excellent 99.98% uptime on average. What’s more, well-qualified and professional technical staff and engineers are monitoring the data centers and web servers 24*7, so that they are able to observe and fix any unexpected issue as soon as it occurs. In this way, the inmotion customers can run their websites without any trouble and unexpected interruption. InMotion provides the latest version of the well-known control panel for the web hosting accounts named cPanel. It also supports the add-on features for a fast and easy installation of Softaculous (open source scripts). Softaculous offers an easy access and installation of many blogging software, CMS (content management systems), wikis and other required customer service tools. They also provides a fully featured , easy-to-use website builder tool that makes the creation very easy. All of InMotion hosting packages are loaded with unlimited storage space, unlimited monthly bandwidth, unlimited email id’s and much. By restricting the number of domains and databases available on every account, users can select one that suits their requirements the best. Additionally, all hosting packages come with cPanel (control panel). With the well-organized and easy to access icon-based interface, it is very easy to add or remove email accounts, manage domains, create custom pages and create FTP accounts. Throughout the hosting industry, some other web hosts outsource its customer support services to the third-party providers. However, as InMotion Hosting users, people will be insured award-winning 100% US-based customer support from InMotion Hosting. All of its support team members have 5+ years of hosting expertise and knowledge, and also they go by regular training to develop their support quality. If you have questions about InMotion Hosting hosting account, the support persons could be easily contacted via 24/7 phone, live Chat and Email. Moreover to multiple support systems, InMotion Hosting support team pledge very quick response time. It’s extensive knowledgebase carry thousands of helpful tutorials and articles as well as YouTube video guides that can help users to resolve most of their common problems as well. Inmotion Hosting concentrate 100% customer satisfaction. If you are not happy with their support or service, you can ask for a full refund of the amount you paid for your hosting within the first 90 days. Apart from this, you can also request a prorated refund after the completion of first 3 months. So in actuality your purchase with Inmotion is completely risk free. And be frankly, no other web hosting companies could give you a better pricing term in the web hosting industry. Although InMotion lacks windows servers platform, this web host still offers some of the top and best quality Linux hosting solutions that money can buy. You also get some amazing features such as 99.9% uptime, unlimited email accounts, and free SSD storage on all servers and much more. The extended money-back guarantee of 90 days that InMotion provides with all plans just goes to show how assured they are with their services. Overall, this provider has solid web hosting solutions and comes highly recommended over many other competing services. Inmotion hosting offers many more benefits, depending on your business needs and there are not many negatives being said about this hosting service provider. HostingRaja is one of the reputed and most trusted web hosting company in India. They started as a web development company in 2005, later in 2006 shifted focus towards web hosting and domain registration. Today they served more than 1.5 million customers all over India and world. They provide a wide option of shared hosting with customized plans for all type of application, website or online project needs. Hosting Raja is the only web hosting company in India providing Java Hosting services. They guarantee 99.9% uptime and “Anytime Customer Support (24/7)” in 15+ regional languages. This site you are at (UpdatedReviews.Asia), is hosted on Hosting Raja. Find out more about our experience in complete review. Hosting Raja started their business back in 2008. Initially started as a web Design and development company later in 2011 shifted focus towards web hosting and domain name registration. Their major comeback was in 2013 with a improved website, more changes and addition in the services like VPS and dedicated servers in their style of functioning. HostingRaja is recognized as one of the fastest growing Web Hosting company in India at the Hostingcon-2015 event held in Mumbai. Hosting Raja is very much reliable and ideal option for beginners and small businesses as they give complete support on installation, account set up is free and they work with you until your website is live. HostingRaja is emerging as one of the most trusted and best web hosting companies in India, where other web hosting providers in India are on the point of losing their business. Hosting Raja offers shared hosting based on linux and windows platforms. In Shared Web Hosting, they provide 6 different types of packages with starting from basic to unlimited features in both Linux and Windows platforms. Shared Linux Hosting Starts at Rs.99/mo. and windows Hosting starts at Rs.129/mo. HostingRaja Offer – Get exclusive 40% Off on HostingRaja’s Hosting Plans. Discount updated on – 1st June 2018 – This Offer Valid for Limited Time Only. INR 1900/- for Year. If you have already hosted a web page and it is getting more visitors and highly popular or if the website is using more resources from the server side or if it’s a magento e commerce based website then their premium corporate hosting plan is best and it costs Rs. 525/mo. At the beginning you may feel the cost is little high but you get an advantage out of it. End of the day web page speed and performance is what matters more. So what makes it so costly? This plan has high end server configuration and the web server has least number of website accounts hosted in it. Hosting Raja has 6 different types of VPS Hosting Plans starting from Basic VPS to Extreme Ecommerce VPS packages. These VPS hosting plans are best for Popular blogging websites and small websites with high traffic large scale enterprise, online stores as well as online ecommerce websites. Hosting Raja is one of the very few hosting companies in the world who offers Java. Java hosting is widely famous in India due to its platform Independent features. Most of the top hosting companies rarely offer Java hosting solution due to high server maintenance cost and lack of technical expertise. Hosting Raja is the only hosting company in India providing Java Hosting plans. Hosting Raja provides Linux and windows based dedicated servers that can opt from three choices CentOS or Ubuntu with controlpanel, CentOS or Ubuntu without cPanel (semi-managed) or Fully Managed Centos or Ubuntu and Windows 2008, 2012 with plesk. The Dedicated Servers come in 6 different packages and the cost will vary on features. However, all the six plans has Root SSH Access, Unlimited Domain Hosting, SSL Secure Server, Free domain name, Full CGI Access and much more. Click on the below image to know more about their dedicated server plans. Hosting Raja provides all types of web hosting plans to cater all section of the webmasters let it be a small, med-size, or large enterprise websites. Hosting Raja offer FREE domain with almost every hosting plan. Hosting Raja offers 24/7 excellent live chat support and ensure that your website is up and running without any downtime. Hosting Raja servers are enabled with Varnish cache. It can accelerate the speed of the websites upto 10x faster, It applies to their shared hosting Servers too. All Hosting Raja servers are secured with 6-phase security. There is no Setup/installation charges or any other hidden cost. Hosting Raja support team will migrate your website from any other hosting company without any charges. Website Backup is taken by the Hosting Raja on daily basis. They provide 30 days unconditional Money Back Guarantee. Hosting Raja uses ticket support system, every technical support related queries from the customer is assigned with unique ticket number and one can track the progress of the query via that support ticket ID. They also provide an escalation matrix system if in case you are not are not getting any proper response from the technical representatives. You can directly send e-mails to their CRM (Client Relationship Management) team and reaches their management levels finally for their CEO. Isn’t it sounds great? Offering 24*7 customer support via phone call and live chat and one unique thing about Hosting Raja is they provide support in all regional language in India. 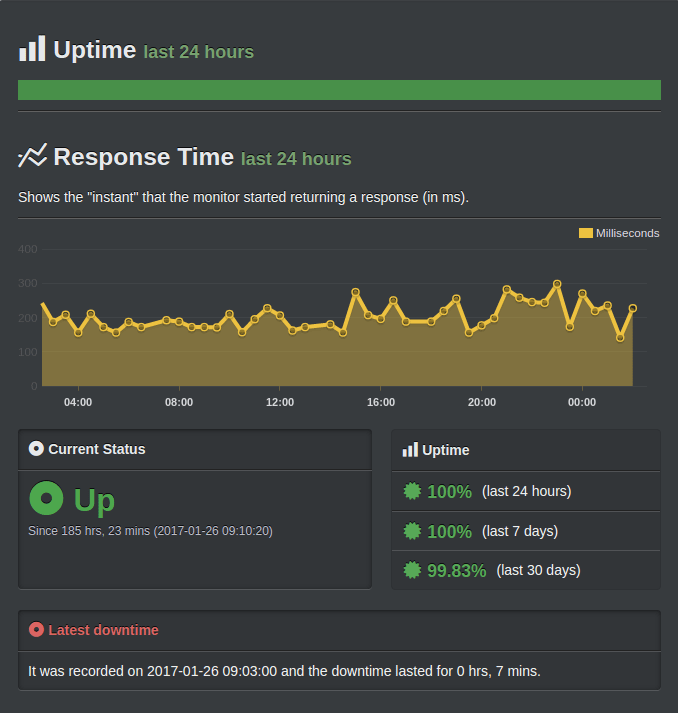 Thanks to Hosting Raja team for their stability in server uptime performance as we hardly experience any website downtime on their VPS servers (Virtual Private Server). Hosting Raja shared hosting is able to manage an average uptime of 99.98% for around an year. Hosting Raja uses RAID 10 Ultra-Fast Hard Drives technology to prevent data loss or any server downtime. As for as Hosting Raja VPS hosting India is concerned so far there is no major downtime, we are getting massive 99.99% uptime. Even our web pages load more faster due to their server latency which comes with in 30 to 35 ms.
Hosting Raja provide 30 days unconditional money back guarantee for web hosting services. The following modes of payments are non-refundable, Bank Wire Transfers, Western Union money transfer, Checks and Money orders. In these payments modes refunds will be posted as credit to the hosting account. There are no refunds on domain name registration, other domain related services, setup fees and administrative fees. If it is more than 30 days still you can get a refund, the service amount would be deducted based on how many months it’s being used by a user. UpdatedReviews doing this Fatcow Review with the motive of listing out various features and hosting plans that are offered by the company. FatCow offers low-cost, featured-rich shared Web hosting and 24/7 technical support. So here is our unbiased FatCow review and expert opinion. Do check out Fatcow web hosting plans and services. Fatcow was born in 1998, FatCow made a name for itself by providing best web hosting solutions for small to mid-sized businesses and websites. FatCow is owned and operated by EIG (Endurance International Group), which is one of the largest hosting business group. EIG also owns iPage, Bigrock, ResellerClub, Arvixe, A Small Orange, Domain.com and many other hosting companies. Because of that, FatCow is not just in rivalry with itself. It’s also in rivalry with its other partner hosting companies. Fatcow utilizes two data centers in the Boston, MA location. Combined, they occupy more than 2400 square feet of space, comprised of more than 800 Web Servers and multiple Petabyte of data storage. Both of the data centers are equipped with 24×7 excellent security, Run on N+1 power on both A/C and D/C. The solid and highly secure network infrastructure of Fatcow incorporated of a pooled server environment, which provides virtually any server on their network the caliber to access Website files or data when any request occurs. This means that the primary machine available will be the one to serve a customer’s Websites, delivering all hosted web pages extremely fast loading time and less service interruption. Hence, the reliability of Fatcow hosting is very good from our editors perspective. Fatcow offers four types of web hosting plans to its customers. You can get (the names of the hosting packages): Original FatCow, WordPress Blog hosting, VPS Services (virtual Private Server) and Dedicated Servers. The Original FatCow is a name for a shared hosting package. This hosting plan has an special introductory price of $3.15/month, but it renews for $8.95/month. The packages include unlimited email accounts, disk space, and bandwidth. You’ll also get over $200 in social networking credits (Google Adwords and Bing ads) when you sign up for a shared hosting plan. Plus, you will get JustCloud’s 1GB cloud storage and access to a free easy-to-use website builder and free domain name. All of these tools will help you set your site up easily. Fatcow Coupon – Get exclusive 50% Off on Shared Hosting Plans. Fatcow’s wordpress Hosting WP Starter plan starts at $3.75/month, and the WP Essential plan starts at $6.95/month. FatCow provides PHP 5.3.x and MySQL 5.1.x with wordpress hosting, because of this, Fatcow’s service has been proved to be 100% compatible with WordPress CMS. Additionally, this hosting plan is featured with Perl, Python, Apache other tools. In Addition, PHP runs as suPHP, which improves the security of the websites hosted on WordPress. Furthermore, Apache mod_rewrite is installed by system itself to make URLs search engine friendly easily. Fatcow also declares 100% compatibility with WordPress (CMS) by authorizing 1-click WordPress installation & PHP 5, Python, PostgreSQL, CGI and other script library. They provide shared SSL certificate helping encrypt the data transferred over the web and free easy to use website builder with hundreds of templates. But, unhappily, it does not support some other powerful features like Cron Job, PostgreSQL, SSH etc. which together put effort to ensuring the good performance of Drupal. VPS Server Hosting is another option. FatCow offers three types of VPS Hosting plans. The Basic VPS plan includes 1 core, 1 GB of RAM, 40 GB of storage space, and 1 TB of bandwidth/transfer. The Fatcow’s Business plan has 2 cores, 4 GB of RAM, 90 GB of web storage, and 3 TB of bandwidth. The Optimum VPS plan has 4 cores, 8 GB of RAM, 120 GB of storage space, and 4 TB of bandwidth. Fatcow VPS plans range in price from $19.99/month all the way up to $79.99/month. Finally, you can also go with a Dedicated Server hosting plan. You will have three choices to choose from if you opt Dedicated Servers hosting. The Startup package has 2 cores, 4 GB of RAM, 500 GB of storage space, and 5 TB of bandwidth starts at $119.99/month best option for Businesses that may be small, but are growing quickly and need more power and high security to accommodate that business growth over time. And Ideal choice for ecommerce websites that may surpass shared server hosting and do not want to be Dominated by other sites on their server. Another option is Professional Dedicated Hosting plan and it has double as much of everything starts at $151.99/month good option for well Established businesses that are ready to take their online existence to the next level by taking benefit of the flexibility and power that comes with dedicated memory resources and using that to spread their website capabilities. Fatcow’s Enterprise plan has 4 cores, 16 GB of RAM, 1,000 GB’s of storage space, and 15 TB of bandwidth starts at $191.99/month.Good Option for successful businesses with high-volume of visitors, frequent data transactions and large-scale website functionalities. Ideal solution for the businesses whose performance and response time are important for online success. 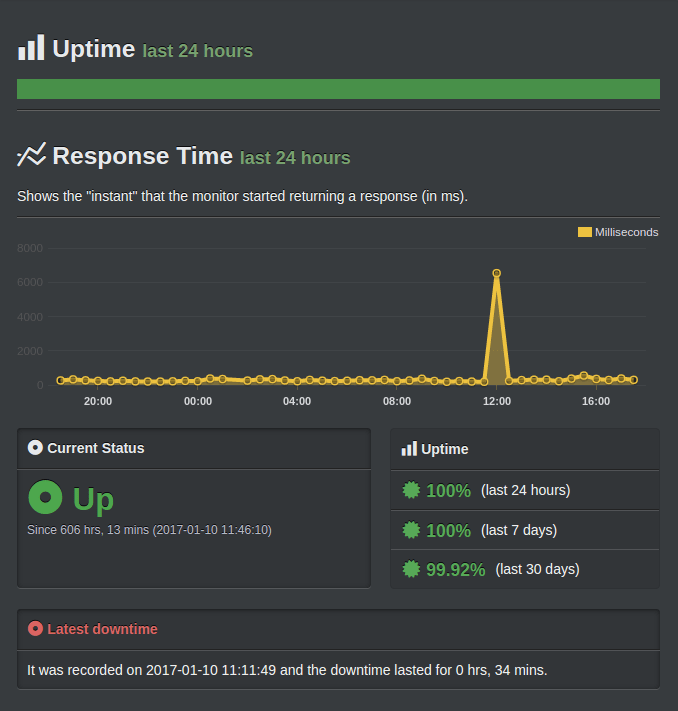 FatCow guarantees solid 99.9% uptime with their web hosting packages. The company utilize 2 state-of-the-art data centers which are equipped with excellent technologies, 24×7 server security, N+1 power (both A/C and D/C) and physical security measures to ensure a stable, strong and highly secure hosting environment. Moreover, well qualified team of technicians and engineers are monitoring the data centers and web servers 24 hours in day and 7 days a week in order to find and address any critical issues as they occurs. So, all customers can run websites without any unpredicted interruption. 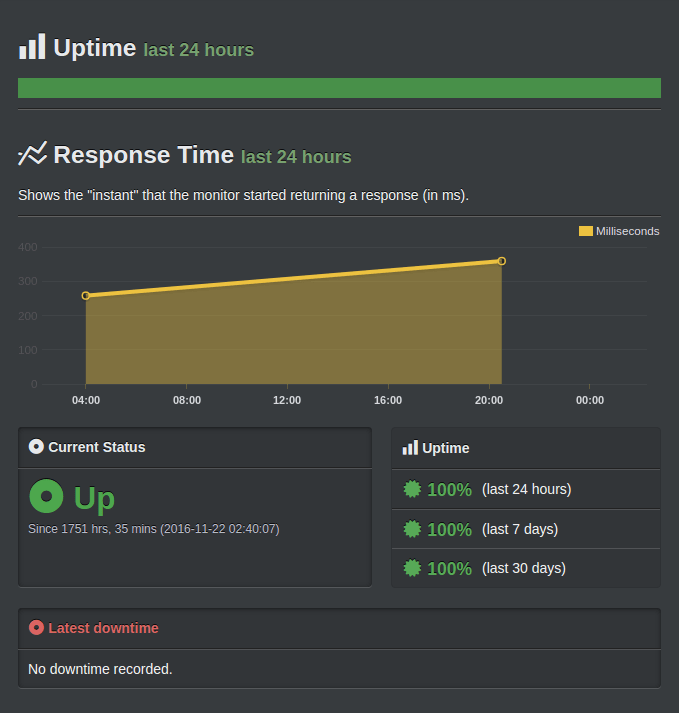 According to our monitoring results, the uptime of this provider is about 99.98% in the past 6 months. FatCow provide custom made control panel with the web hosting packages . supports almost all programming/scripting languages and technologies used in Linux operating system platform, along with PHP 4 & 5 Support, CGI directory, MySQL Databases, Python and script library. Their control panel also allows you to easily setup your eCommerce, online store, CMS, Online Blog, Discussion Forums and Image Gallery website, to create your first website with their easy to use site building tools. The web hosting service of Fatcow contains many excellent features, including unlimited web space, unlimited monthly data transfer, email accounts, MySQL databases, and FTP accounts, and a bullpen full of website templates. Additionally, FatCow offers SSL Secure Server to encrypt the data when it is transferred across the web, which expand the security of the websites hosted on the server. Bonus Google Adwords Credit! Get more and more visitors to your website instantly by using the $100 Adwords bonus. Bing Search Advertising Credit – Tap into Bing traffic. You can start with $100 Bing ad credit. Free Yellowpages.com Listing: Get your site listed on Yellopages for free of cost. FatCow provides a vast online help center and support ticketing system plus step-by-step knowledgebase and tutorials for using your hosting account. They provide 24*7 toll phone (toll free for US Only ), live chat, twitter and email system with calls answered in less than a minute. Their support team goes through heavy QA testing. Plus, feel more secure with a 30 days money-back guarantee. FatCow Support Includes: 24/7 Phone (Toll free- US only), Live Chat, Twitter and Email Support, extensive Community Directory, and Ticketing System, Rigorous QA (Quality assurance) Testing of team members. FatCow let you try their hosting service without any risk. They offer a 30-day refund policy for those who want to cancel their web hosting account. This means if they do not meet all of your requirements, you can freely cancel your hosting plan anytime within the first 30 days and FatCow will refund your full money – no questions asked. The 30 days money-back guarantee, although, money back is only valid to credit card payments. At the time of writing this review, FatCow doesn’t offer the guarantee for other payment modes. In addition, moneyback does not applicable to most of FatCow’s add-on services, including domain name registration or installation . Keep in mind that a minimum $35 early cancellation charges may be applied to those who make decision to cancel their hosting account after the 30 days of the trial period. This is a bit of a disappointment or drawback compared to other top web hosts that offer a refund / similar money-back guarantee, such as iPage, Hosting Raja Bluehost. For those of you who are searching for long term reliability and a hosting company you know you can blindly trust, FatCow is the best option for you as they have been in the industry since 1998 (18 years) and continue to be one of the most popular and superiors in the hosting industry. Anyhow, they manage service in a much unique way requiring you to sign up for long terms in order to get access to the most affordable and very best of their pricing structures. They also appear to be little slower than many of the other hosting providers out there and fail to offer some of the best flexibility, application and software features and benefits especially when it comes to PHP based functionality. If anyone is looking for a hosting service provider to being your journey into the Internet, FatCow is an excellent,ideal option as it is the most user friendly and easy to use service to be found. However, their services and pricing structure make it hard for you to smoothly upgrade and change the state of your current plan quickly as you will be locked in for longer periods of time. Yet, if you need a simple to access hosting service that is cost-effective and perfect for simple web pages, FatCow is difficult to beat. Keep in mind that a minimum $35 early cancellation charges may be applied to those who make decision to cancel their hosting account after the 30 days of the trial period. SiteGround is an independent web hosting company founded in 2004 and has little slowly but steadily become one of the popular and top web hosting providers. With award winning professional customer support and wide variety of hosting solutions available, there is approximately nothing you could seek more from a web hosting service provider. With web hosting packages that are customized for fast speed and high security and come with excellent features like free domain name, cPanel & SSH Access, free daily backups, 24*7 customer support, SSD Storage, 99.9% uptime and 30 days of money-back guarantee means that your website is in secure hands with SiteGround hosting. Their shared hosting plan starts for just $3.95/mo. SiteGround was founded by a few university friends in 2004, headquartered in washington d.c. US, 2002. Today they have employed more than 280 staff members and the company is still growing. SiteGround’s data center are located on three different continents: North America, Europe & the Asia-Pacific region, with servers in London (UK), Chicago (USA), Singapore and Amsterdam, Netherlands. This allows users to opt the nearest one to where their valuable visitors are located to get the best website performance and speed. Tenko Nikolov, main founder and CEO of SiteGround, started working as a technical support back in 2004. Today, SiteGround hosts over 500000 domains worldwide. They manage 2,000+ live chat requests, 1,500+ support tickets and 800+ telephone calls every day. SiteGround offers various hosting plans for WordPress. The cheapest and economical, as expected, are shared web hosting plans. Get exclusive 60% Off on SiteGround’s Hosting Plans. Discount updated on – 1st Jan 2019 – Offer Valid for Limited Time Only. INR 3200/- for 12 months ($3.95/mo. ).All of Siteground’s hosting packages come with cPanel and Softaculous, and although they are powered by shared hosting environments, their accounts are separate to ensure susceptibilities that exist in one hosting account cannot affect the security of another in the same server. Also Check SiteGround Coupon Codes. SiteGround’s dedicated hosting plans have more resources and features, which often contain multiple CPUs and hard drives. The company offers complete management services for your server, which has the similar features as cloud servers of SiteGround. Although, this type of server has support for 5 dedicated IPs rather than 1. Siteground’s Reseller Hosting Programs works off a credit based system. To join the program order just 5 minimum reseller credits, also you can then top up by just 1 credit after that as needed. The these credits never expire, so once you have a credit you do not have to activate it until you require it. Whilst we at the beginning were raving about their Cloud plans, the reseller hosting is a much more cost effective and economical way to buy standard hosting. SiteGround has 3 shared hosting plans, including StartUp (Crafted for a Great Web Start), GrowBig (Crafted for Your Web Growth) and GoGeek (Crafted for Real Web Experts). All the three plans are much costlier when compared with other well know shared hosting providers. Here we are going to share detailed information about their hosting features. And you will realize whether SiteGround is made for you or not. Three of the hosting plans include 10 GB, 20 GB and 30 GB web space respectively, which is extremely less than unlimited. As for the capacity, these plans are specially designed for websites with different volume of visits: 10,000 monthly visits best for StartUp, 25,000 monthly visits for GrowBig and 100,000 monthly visits for GoGeek. Along with above features, the three packages have few similar features like Free Website Builder, cPanel & SSH Access, free domain name, unlimited data transfer, Free Let’s Encrypt SSL’s and unlimited MySQL databases. To be honest, all of these features are basic and sufficient for most small and mid size traffic websites. But we believe website owners can get more resources and much better services at the same charges. One of the most important elements that should impact your decision to choose for a hosting company is the type of customer service they offer. As a webmaster, business owner or blogger, 24/7/365, excellent customer support is much necessary because you never know when you might encounter some issue with your hosting account that needs instant resolution. This is exactly where SiteGround ratings heavily with a support staff of highly talented and professional technical professionals. You not only receive a fast response, but they can easily manage any kind of queries related to your web hosting account or website. Their support team is available 24*7*365 days via the ticket support system, live chat or telephone and toll-free support. Siteground lend a give a personal touch through the support personnel (via live chat or phone) you discuss the concern with. You can easily check the support person’s profile, technical skills & background, areas of specialisation and interests along with years of total experience. The extensive self-help tutorials and wide-ranging knowledge base or all different type of hosting platforms, along with SiteGround webinars provide you accessibility to a boundless information and troubleshooting manuals. SiteGround offers excellent speed and guaranteed uptime with data centres located across three top continents: Asia (Singapore), Europe (Amsterdam), London, UK and Chicago, USA. You have the freedom to choose the data centre that is nearest to your target viewers to give them extremely fast access to your website. The SiteGround team of experts constantly experiments with various arrangements and keeps upgrading their hardware and web server formation for their dedicated servers. They guarantee that the hosted accounts on their server are rapidly and easily migrated to the latest hardware resources after upgradations. This whole process makes their server uptime and performance best at all times. 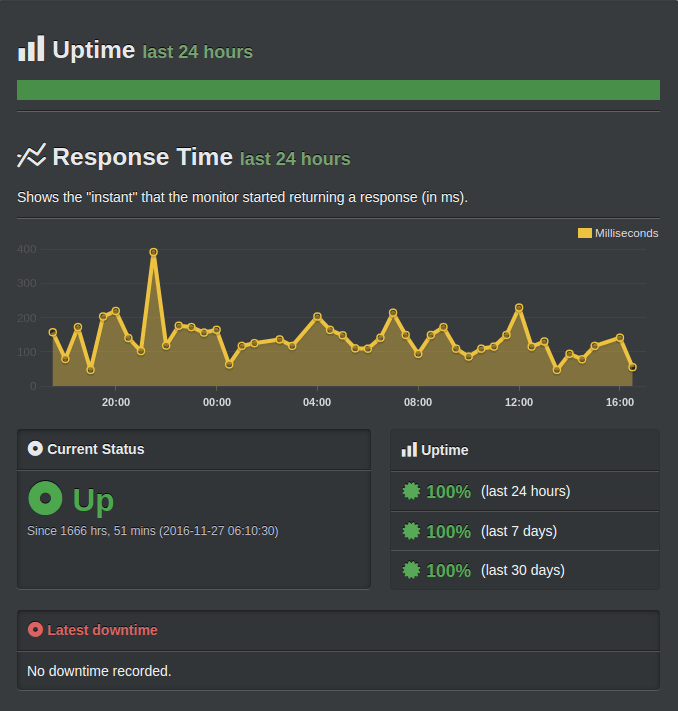 SiteGround provides an uptime guarantee of 99.99%, which means a very slight down time. They are able to attain this with the help of their custom server monitoring applications and softwares. These softwares and applications keep observing the status of every web server in real-time and also reduces downtime by automatically fixing more than 90% of the server performance problems that come up, without human interaction. With Siteground Hosting account you get the industry standard cPanel (control panel), which gives you easy access to the Softaculous auto app installer as well as their custom installations for popular CMS’s like WordPress, Joomla and Magento etc. The control panel is easily available in the client area of your hosting account. You get access to SiteGround’s SuperCacher (a web caching service For Great Speed) that has been particularly developed based on Varnish Static Cache, Varnish Dynamic Cache and Memcached. It makes retrieving website more faster by saving the pages on the visitor’s browser cache when opened for the first time. Thus, it decreases the load on your server outstandingly. You also get WordPress, Joomla and pre-installed Git Toolkits that permits you to easily manage your domain, reset your account passwords, solve any broken permissions issue,configure SSL Certificates and move/delete your installation. The Final Verdict: Is SiteGround Right For You? We highly recommend SiteGround. It has extraordinary and amazing services as well as features. The price might seem a little higher, but it is reasonable considering what you are getting with your hosting account.